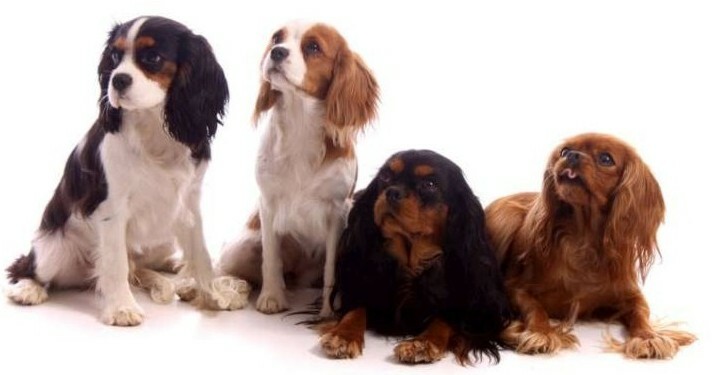 The Cavalier King Charles Spaniel comes in four gorgeous colours! whole colors. Blenheim is the most popular and common color with Tri’s being second in popularity. Whole colors which are the Black and Tan and Ruby are not as common and can be harder to find. All four colors carry the same sweet loving Cavalier disposition that is so admired in the breed. may develop within the first year as well. make-up of a Blenheim is ee:ss. Blenheim is the easiest color genetic make-up. Blenheim bred to a Tri Color can produce either Blenheim or Tri Color puppies. on the chest, center of face and paws and may diminish with age. white mismarking on the Ruby colored puppies is possible. underside of tail. The genetic combinations for Black and Tan's are very complicated. When bred to a Blenheim or Tri they can produce all 4 colors. Black and Tan to Ruby and only Blank and Tan's and Rubies can be born. age while a large amount some will remain. White on the feet tends to stays. The Ruby is a solid whole-colored rich red with No white. on Ruby and Black and Tan puppies. the richness of the Blenheim puppies coloring. their blaze entirely by their first birthday. The wider the blaze at birth the wider as an adult. Some beauty marks/freckles may develop within the first year as well. When you breed Tri Color to a Blenheim you can receive both Tri Color or Blenheim. Tri bred to a whole color can produce all four colors with the possibility of white missmarking’s. thinking your Cavalier Spaniel puppy’s coat will stay exactly the same as he grows. Like many other breeds, Cavalier King Charles puppies grow into their colors. it’s a sure bet that your little companion will grow in some chestnut “freckles” to surprise you! But after all, isn't watching your puppy grow into his adult coat really half the fun?